I try and be nice, I really do. My mother and father raised me to be a sweet girl, but sometimes the fashionably challenged push me too far. And this time, Martina McBride is the culprit. What on earth was she wearing to the country music awards and even better, why does it seem that this awards show is always the most confused fashion wise? I know these people have stylists, I really do. They are rich, they are famous and yet, they seem to miss the ball quite often. I am all for the overdone look of country even if it might not be my thing, but at least get it right. Nashville is a far way from Hollywood, but beautiful clothing travels well and designers are eager to show off their best pieces. Stylists are the middle man, so either Fed-Ex never delivered the package or the stylists never received the message. The tragedies are obvious. Oh, Martina. Why the over-done beach tunic? A Vegas pool for a pina coloda maybe, but an awards show? To add insult to injury, you (or your stylist) paired it with a peep toe pump. A PEEP TOE PUMP!!!! When has ’50s style chic and Vegas showgirl beachwear gone together? Your very overdone Native American style earring are doing nothing but overwhelming your already insanely embellished neckline. At least you wore your hair done to mute the gaudiness of this ensemble. The ring on your pointer finger and layered bangles, although a crime, go almost unnoticed against the other atrocities of this look. And for my final blow, I will bring attention to the fact that you are a wrinkled mess. Oy, my eyes hurt. Tall Women Can Find Pants That Fit!!!! One of my favorite clients is 6′ tall and hot. Unfortunately, the world of clothing is not her best friend. She has tons of trouble finding any pants that don’t end up looking cropped. Note to designers: Not all women are between 5’2″ and 5’8″. They also are not all 115lbs. This may come as a shock to them, but I will continue to try and get the message out there! As always, I have put on my detective cap and found a store that caters to tall women. Unfortunately, like a lot of major stores, it only caters to them on-line. Alas, at least there is a way to find pants that you can even wear heels with! Crazy, I know. Banana Republic is fantastic about having an amazing range of sizes… on-line. Big, tall, wide, skinny, this store actually does have it all. When I come across sizing problems, I always turn to their on-line store for both men and women. I found this necklace and I almost died. Sometimes when I find beautiful things my heart literally skips a beat and I often feel faint. It is a very strong reaction. I then gather myself and realize that for a certain amount of money, I can feel that way everytime I put it on. And people ask why you need so much money, ha! 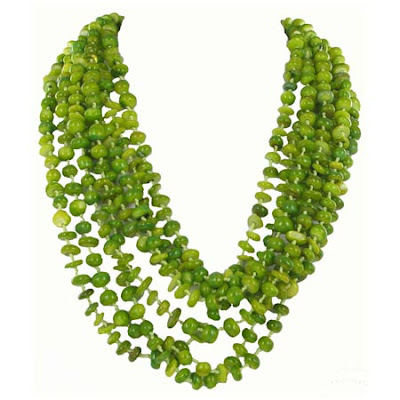 This eight strand green shell necklace is a beautiful creation. It is big, bold and most importantly, not all that expensive. For $150 you can own this amazing summer necklace that will make any of your simple ensemble sing. The color is outrageously amazing and the multi-strand design is spectacular. Can you tell that I like it? Owning stand out pieces actually makes getting dressed much easier. I know a lot of people veer away from loud accessories such as jewelry, shoes and bags, but those are really the easiest pieces to style! It allows you to not think about your outfit… at all! You can put on a basic all white ensemble and then your amazing stand out piece will do just that, stand out! Sometimes your clothing can be the backdrop to your outstanding look. Oh to be WASPY. You may not come from this pedigree of a background, but you certainly can look like it by choosing the right pastel pieces. It is so beachy and fresh, yet ostentatious in a twisted way. You just look like you got the Benjamin’s. Hell, rock it if you can… Talbots apparently stays in business for a reason. Originally being from Connecticut it is completely amazing that I have never been to Nantucket or Martha’s Vineyard. I make up for it by going to Newport, R.I. and Cape Cod. I must tell you though, the overwhelming differences are just that, overwhelming. People imagine a land of hoity toity individuals that travel around in their Mercedes going from lawn party to lawn party.. Ok, that is partly true for certain areas, but not the norm! If Nantucket or Martha’s Vinyard are your final destination, then hitting up the local Talbots, or at least looking like you did, is a fashion must. It is truly a great experience when you can actually be someone else for a weekend just by changing up your style. You are still you, just with a pastel ensemble on. Acheiving this look is really not all that hard, it is just about the simple basics of what makes up a fancy and beachy Nantucket look. Please refer to this very happy (and rich looking) couple pictured above. The key is to be simple yet casually elegant. Simple jewelry (bigger stones, yet not to ostentatious if you got it) is a must. Nothing overly funky or attention grabbing are key adjectives to live by. Cardigans and shawls for layering are the only go-to pieces you should have with you. In fact, I think that is all they sell there:) Top it all of with an oversized pair of fabulous sunglasses and you are ready to sip a very fancy drink at a very fancy lawn party. 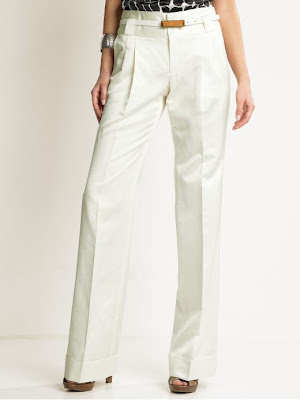 As for men, they key is light and airy pants that for some unknown reason are slightly short. I swear. You want to show off your loafers with no socks. Tucking in your pastel button down with a ribbon style belt or rope belt is cinching your Nantucket chic. Aviator sunglasses and a very expensive watch with make you look like one of the good ‘ol boys. Now you are ready to roll with the other power couples in Nantucket. No one will ever know the true amount in your bank account as long as you look the part…. The Reef flip flop has been one of my long standing favorites. There are a few go-to pieces in my life that have lasted me through the years and have quite simply been the best purchases ever. These amazing little gems are definitely one of them. A surfer brand at heart, these shoes have been hitting the beach for years. Luckily for the rest of the overly fashionable world, the brand is starting to venture into fun and sassy styles. I have a pension for anything and everything gold and when I came across these suckers in Florida, I was smitten. They look SOOOOOOO much more expensive than they are. They actually even look like wood once they are on your footsies! The greatest part is that are actually rubber…. Oooh, comfy. The reason Reefs are a definite piece to own is much more like a list than a point or two. Let me explain with a little story…. Back in ’01 when I was studying in Auckland, NZ I was hiking overnight (yes me) and I was in desperate need of a pair of flip flops. I got to the bottom of the mountain dirty and gross, the clouds parted and there it was, a tiny surf shack. There were barely any shoes left except for one shiny pair of blue reef flip flops in my size. They were clearly destined to be mine. Eight years later I still wear my fun purchase proudly. They have seen everything (I will not go into detail) and they keep on ticking. 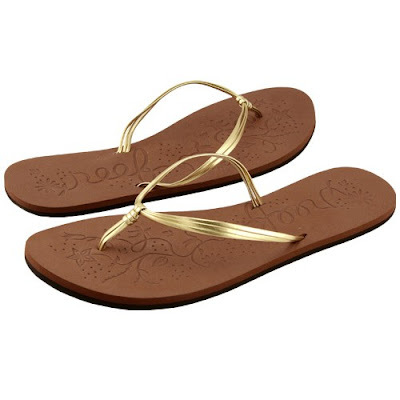 I cannot tell you how many times people have stepped on the back of them and they have yet to rip. How many of your flip flops have ripped apart? Exactly. The second fabulous thing about them is that they DO NOT need to be broken into. They do not require bandaids or any type of first aid in order to allow you to wear them. They are comfy from the moment you put them on your feet. For less than $30 bucks and years of wearability, is there a better deal in town? I think not.